The City of Atwater is warning residents about a contaminant in their drinking water that could lead to cancer. 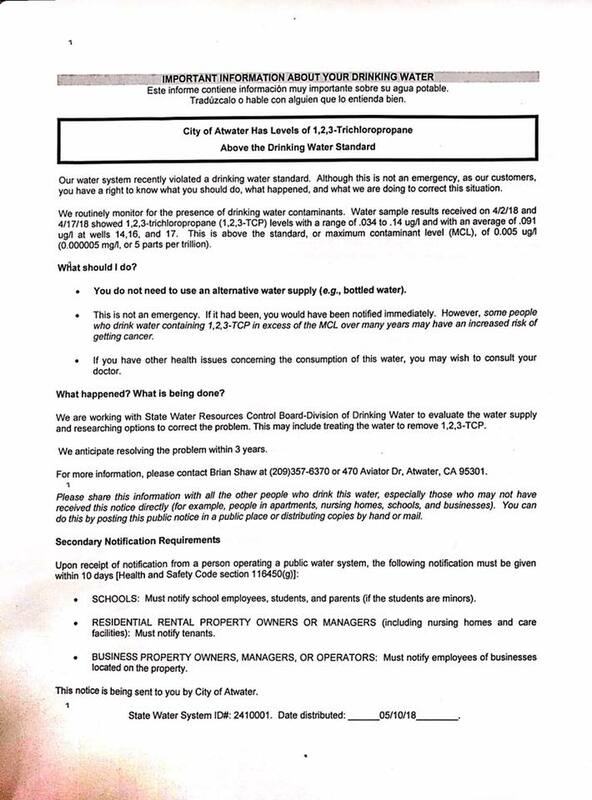 This is the letter sent out by the city of Atwater California. The city has 3 years to fix the issue. Officials said nine out of the city’s ten wells registered excessive levels of TCP. Interim Public Works Director, Brian Shaw, said the finding comes after the state water board created more stringent regulations for TCP. City employees are working with a consultant to figure out a solution. “It looks like we’ll be doing granulated activated carbon, so we’ll be putting four to six vessels at each well site,” Shaw said. Area schools, like Buhach Colony High School, posted the advisory on their website. Ted Walstrom with the Merced Union High School District said they’ve tested drinking fountains at several campuses to see which ones filter out TCP. For the ones that don’t, he said they’ve applied for a grant to get better fountains. “We come in line in June. They’ll start processing our applications and help us try and fix the water prior to the municipality getting their water fixed,” Walstrom said. Walstrom said the issue did not impact Merced schools. Atwater has also filed a lawsuit against Dow AgroScience and Shell Chemicals (which is owned by the same company as Shell Gasoline). The two companies created fumigants from TCP and sold it to farmers under the brand names Shell D-D and Dow Telone. The chemicals were used heavily in the 1950s, ultimately contaminating the groundwater. “It was a soil fumigant for pesticides in the ground. They were the ones that made it and sold it,” Shaw said. The city is hoping the lawsuit will provide the tens of millions of dollars needed to clean up the contamination. Based on state standards, the city has three years to fix the issues. Shaw said that based on expert opinions, the chances of getting cancer from drinking the water for several years is very low.